The following photographs were taken around 1961, the top picture is a well known photo but has never been seen as a panoramic view before. On closer inspection, the roofs of Sefton Terrace have large areas of missing tiles, indicating that demolition may have started. 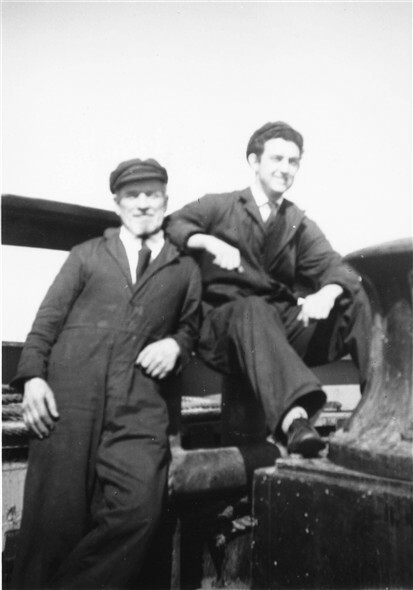 I'm not sure when Sefton Terrace was demolished, but the third photo of the East Quay was taken in 1961. 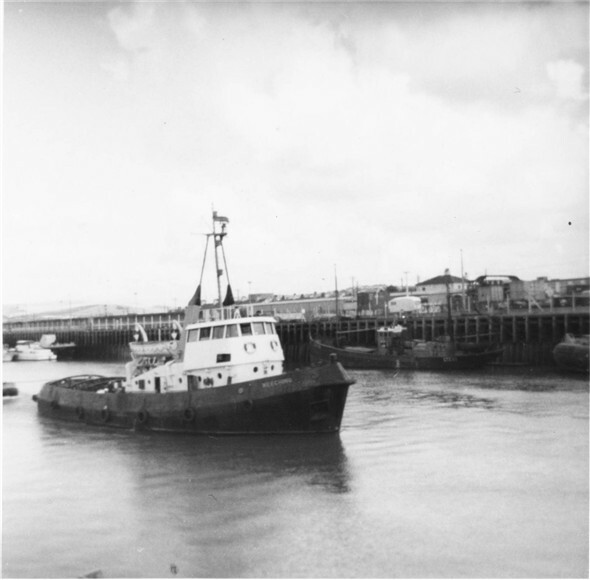 An early shot of our much loved Meeching Tug moving through the harbour is followed by a final photo of Sally Flowers and his Nephew Bob Stonehouse aboard the Meeching. I wonder if my Dad, Bob, had just swapped over Sally's soup labels. Poor Sally, he never opened a tin of tomato soup without it containing beef oxtail or spring onion ! This page was added by Laurie Stonehouse on 13/05/2009. 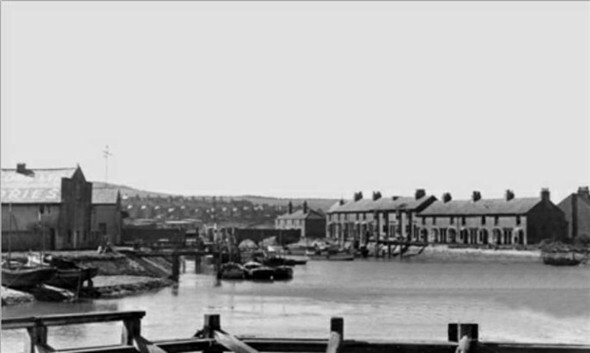 We used to dive and swim off the old Island Bridge in the early 60's, but I don't recall Sefton Terrace only Fludes! I like the picture of Sally and Bob. Anyone remember the time my late Father dyed Sallys beard bright green while he was sleeping? I certainly do remember Sally's green beard, but I didn't know who had done the deed. It was so-ooo funny to see him trying to ignore it and unfortunately for him it lasted for ages. Now I wish I could find a less striking colour to get rid my grey hair!! Hi William. I have to put my hand up here as the guilty perpetrator of the Green/Blue beard episode. 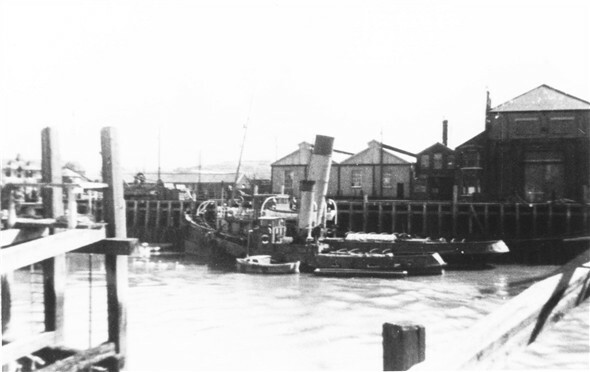 We had all been across to the sergeants mess at the RAF crash boat base which was between Fort Road and the river. Sally called it a day and returned to the Meeching. When we got back it was decided Sally would look better with a Blue beard. We did it while he slept. It turned out looking more green than blue. As you say it lasted for weeks as Sally tried desperately to wash it out. They were great days.